The invasion of ramen definitely captured the Pinoys who love anything all Japanese. Ramen Nagi is a personal fave when I ask anyone for their go-to ramen place. Good news for Ramen Nagi fanatics especially from the south. Ramen Nagi just opened their first flaship store in Asia. In the heart of Bonifacio global city at One Bonifacio High Street Park. The mall ain’t completely occupied yet but it’s distinct location includes M. Bakery for those who want to point the mall’s location. The concept store is located on the 2nd floor of One Bonifacio High Street Mall. This concept store is different compared to the other Ramen Nagi outlets. This is more minimalist, spacious and intricate Japanese interior designs. Don’t expect a lot of red like the ones we are used to see. The opening of the concept store was on October 29, they flew over their top chefs to present how to prepare the orignal butao, everyone’s classic fave, truffle king ramen, szechuan ramen and other favorites. Only for this specific flagship store is the truffle king ramen will only be available till December. For those with an adventurous palette, with caution LEVEL 20, Szechuan Ramen will be available in all Ramen Nagi outlets from (Nov 1-15). Seeing it prepared infront of my eyes was mindblowing especially the presentation of the ramen itself. Come on over to the first Ramen Nagi Flagship store at BGC! Ramen Nagi, the Fukuoka-born, Shunjuku-grown ramen shop that has taken Manila’s noodle lovers by storm, has opened its very first concept shop (the only one in the world) at the recently opened One Bonifacio High Street development adjacent to the Philippine Stock Exchange building in Bonifacio Global City. The new store features décor that are decidedly different from the colorful, festive aesthetic that permeates all other Ramen Nagi’s shops worldwide — born out of sketches personally made by Chef Ikuta Satoshi, the man behind Ramen Nagi. This shop combines Japanese minimalist design with an open-concept design to create an unrestrained, unfussy zen-like feel. Intimate booths and blond wood chairs line stark white walls on one side, while a marble countertop seating offers front-row views of the kitchen activity on another. In the center of the room, white lamps cheekily decorated with images of ramen bowls hang over sleek communal tables. As a launch offering, the Ramen Nagi at One Bonifacio High Street will be the only shop to offer the Truffle King Ramen, an aromatic treat filled with the flavors of the desirable mushroom delicacy, until December. Come the new year, fans can slurp their way to a truffle-licious bowl in all the other Ramen Nagi branches across the Philippines. Originally a brainchild of Japanese chef Ikuta Satoshi, Ramen Nagi finds favor among ramen fans for its steaming bowls filled with rich broth, springy noodles and quality ingredients. The award-winning ramen chain offers four variants in its menu, namely Original King (creamy umami tonkotsu broth), Red King (spicy), Black King (with squid ink), and Green King (with basil pesto)—all served with a scrumptious slab of charred pork. Aside from these four regulars, Ramen Nagi also offers two limited-edition flavors every month. 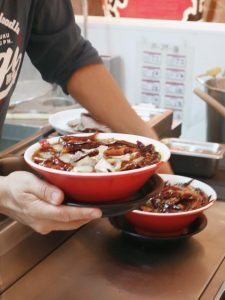 Patrons can also customize their own bowls based on an omotenashi sheet that lists options for the richness of soup, spiciness level, firmness of noodles, heaviness of sauce, amount of garlic, and choice of pork shoulder char shu or belly. According to Chef Ikuta, there are three steps to eating the ramen: taste the broth, season with a generous amount of spicy sauce, enjoy the noodles and slurp to show the chef your appreciation. And at this new, more upscale outpost, loud slurping is definitely still an option. During the launch, Chef Ikuta — together with Chef Riyoichi Nishio — showed members of the media how to prepare two limited edition ramens: the Truffle King Ramen and the Szechuan Ramen, which will be available starting Nov 1, 2018. The two chefs also led the tradition of painting one eye of the Daruma, symbolizing the setting of goals for the store. As a custom, the second eye is painted once the goals of the store have been met. The new Ramen Nagi concept shop is located on the 2nd floor of One Bonifacio High Street, 28th street corner 5th Avenue, Bonifacio Global City, Taguig City. Visit and like http://www.facebook.com/RamenNagiManila/ for more information. Follow @ramennagimanila on Facebook and Instagram for more updates.